The following recipe was inspired by a white bean spread from 3 Doors Down Cafe, one of my favorite places in Portland. I was pretty excited when one of the BFFs sent me the link to the original recipe, but when I looked it over, the ingredients weren’t what I expected. I didn’t remember tasting red chili and I would swear I tasted anchovy. Who knows, maybe my taste buds are just whacked? I played around with the ingredients a bit (because I’ve recently come to the conclusion I’m not a big fan of rosemary) and ended up with something pretty darn yummy and not completely far from the original. Enjoy! Note: Boiling your own beans is definitely an option, but truthfully, I couldn’t be bothered this time. And since you’re going to buzz the whole lot, it won’t make much difference. At least that’s my opinion. Cook the shallot, thyme, anchovy paste and garlic in olive oil until soft. Add beans and about 1/4 cup water or chicken stock. Heat through. Puree mixture in blender until smooth and uniform. Add more water if needed. Season with salt and pepper. 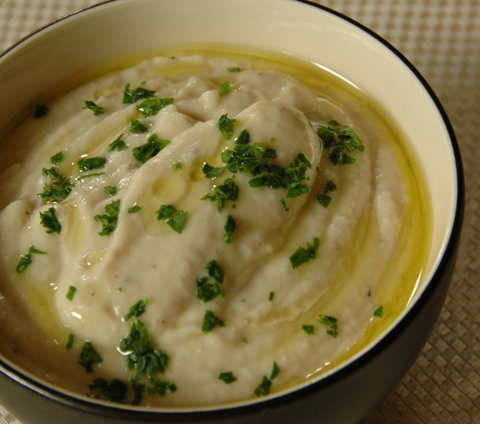 Drizzle with olive oil and garnish with parsley and serve with crusty bread. Mmmmmm - that dip looks yummy! I love simple and easy. Through in delicious and I'll follow you anywhere. Enjoy the long weekend. I think anchovie paste is the key ingredient here. I use it a lot as on the side with veggies. I think anchovie paste is a key ingredient here. I use it a lot on the side with veggies. i love white bean dip!! sounds so tasty! Mary, well, it rained here most of the weekend, but at least we didn't miss being outside while we were working on our basement. Momgateway, I agree! Add salt just makes it salty, while adding the anchovy paste also gives it umami. Christina, I love it now too! As long as it's not mealy. I can't eat bean dips made with pinto beans because they are so mealy.